With so many old venues across the country having their own horror stories, it’s not surprising that many theatres are inherently scary places – let alone the infamous ‘Scottish Play’ superstition. 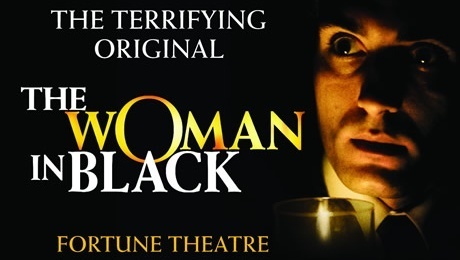 The Woman In Black is the ultimate theatrical ghost story, with Stephen Mallatratt (who adapted the story from Susan Hill’s 1983 book) becoming the Mary Shelley of the theatre. It’s no wonder that, after almost twenty-five years, the show is still a permanent fixture in London’s West End – even if the perpetually squeaking seats of the old Fortune Theatre are a little distracting. It’s surprising, then, that it all begins on a comedic note. The opening scenes set up a play-within-a-play, creating an amusing dynamic between The Actor (Tim Delap) and Arthur Kipps (Crawford Logan). As a result, the production does take a little while to get going, although the theatrical conceit does frame the drama nicely and eventually proves fruitful with its final twist. The comedy also serves to lull the audience into a false sense of security that makes the scares all the more pertinent. And eventually the scares do come. Despite a few cheap, jump-out-of-your-seat moments, the production mostly relies on mood and eerie, chilling atmosphere to frighten the audience. The Woman In Black is a marvel of gothic storytelling and suspense, owing particularly to the impeccable delivery and pacing of the two actors who aren’t afraid to let palpable silence hang threateningly in the air. The stage is mostly bare, with limited props used to represent locations, furniture and transport, all smothered with thick fog that curls and looms over the stage and audience. The mood is amplified by the evocative use of (candle)light and shadow that disorientates as much as it highlights key moments. You’ll be questioning every tiny movement, every menacing shadow, every grim silence, awaiting the next spine-tingling horror. Mostly, The Woman In Black celebrates the power of theatre. No doubt ticket sales have boomed following the 2012 film (with Daniel Radcliffe in the lead role – here, totally surpassed by Delap), but the theatre production is a far more frightening experience – in part because it feels so much more real, but also as a result of its limitations. “Know your audience”, the Actor repeatedly tells the elderly Kipps during his “performance”, whilst he explains how the audience’s imagination will fill in the blanks. He is absolutely correct – no amount of CGI can compete with the human mind. Watch: The Woman In Black continues to run at the Fortune Theatre, ticket info here.